We’re proud to announce that from today we are expanding our call feature for AT&T users to start and receive phone calls directly from your browser via the mysms web app. The new integration will offer you way more convenience in your daily management of your voice conversations especially when you are sitting in front of a computer during the whole day. This feature will be released in beta and is part of mysms Premium. As web app or desktop app user, you already know how handy it is to get notified on phone calls directly on your computer. With mysms Premium you can also take an incoming call with just one click or start a new call by inserting a contact name or number. However, you still had to talk on your Android phone. This requirement was by far the most frequent feedback on the call feature among our Premium users. Therefore, we have been working hard to remove the need to take your phone into your hands when calling from a computer. AT&T is the first carrier to provide us with the necessary APIs to launch this enhancement, but we expect to expand the functionality to other mobile carriers when the APIs are available. Currently, AT&T cloud calls is only available for AT&T users with a postpaid plan. You need to be based in the US and can only call US numbers. International calling is not supported by AT&T. When you start and receive a call via the web app you will be charged in accordance with your existing mobile agreement. As this feature is part of mysms Premium, you need to have an active subscription in order to qualify for this feature. How do I activate AT&T cloud calls? 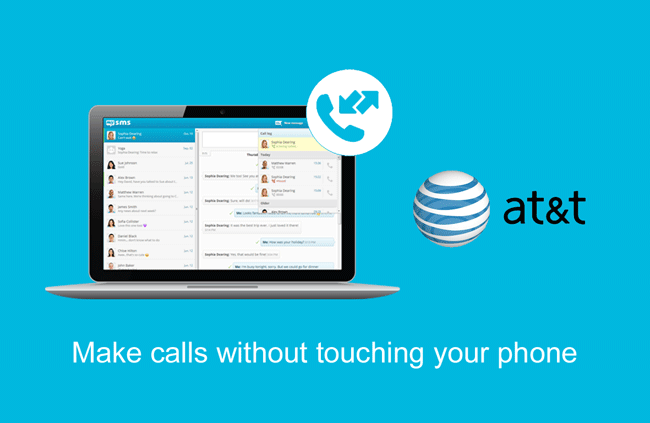 The AT&T cloud calls feature is currently only available via our web app on your computer (no tablet support). Make sure your microphone and speakers are connected to your computer and switched on. Open the web app via a WebRTC compatible browser (Chrome, Firefox, Opera). In order to use the feature with Internet Explorer or Safari, you need to install a WebRTC plugin to enhance these browsers. Congrats, you are all set. In case you would like to deactivate this feature at a later time, simply go back to the mysms settings and click on “Disconnect from AT&T cloud calls (BETA)”. We hope you enjoy calling from your computer and are happy to receive your feedback! 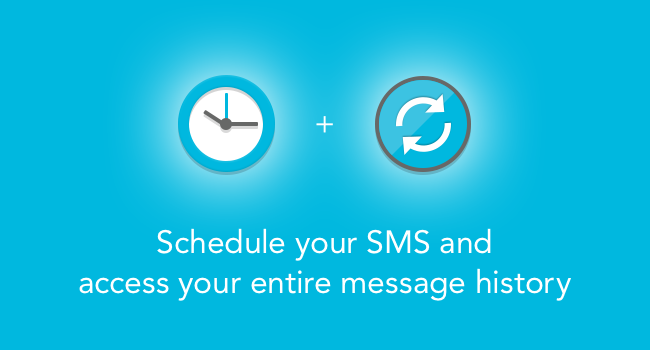 Welcome to the Premium family, SMS scheduler and message history! mysms Premium got two new family members: Schedule your SMS and access your entire message history. These features should help you to better manage your messages anytime and on any device. Welcome to the mysms Premium family! Have you ever been in this situation? You remind yourself that one of your best friends’ birthday is tomorrow, but you forget to send your birthday wishes on the actual day? This won’t happen anymore, as you can now schedule your messages. Compose a new message and tap on the schedule icon to set an exact date. Your message will be sent at your chosen time in the future. Are you looking for a specific text message a colleague sent to you a few weeks ago? With this Premium feature you have access to all your messages that are synced to the mysms cloud. If you text a lot, it can be very challenging to search all messages and conversations manually. As Premium user the full-text search will browse through your entire message history. Did you already have the chance to take a look at these new features? In which situations will you use the SMS scheduling feature? If you haven’t activated Premium yet, subscribe to mysms Premium directly in the mysms Android phone app or in the web app. Many people prefer to customize their apps to make them fit to their personal style. In this quick tip we would like to show you which options we provide in our Android apps. 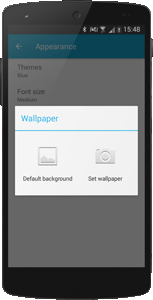 In addition you can choose individual wallpapers. These can be enabled under “Sidebar – Appearance – Wallpaper”. To ensure the legibility of your text messages, we suggest enabling the speech bubbles in this case. Those of you who think that the font size is too small or too large, will find an option to resize the font under “Sidebar – Appearance – Font size”. This option is only available for mysms for Android phone. 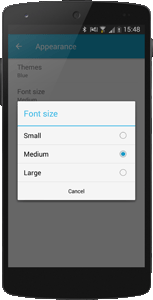 Tablet app users can adjust the font size in their Android settings. Do you want to know at first sight if your best friend is texting you? 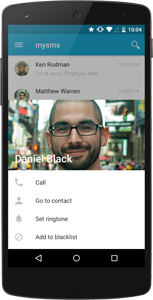 For this case we integrated options to define customized notifications for specific contacts. Start the mysms app and tap on the contact pic/avatar to open the contact options. If you choose “Set ringtone” you can customize the ringtone, vibration or LED (if supported by your phone). Do you like the customization possibilities or are you a fan of standard settings? Time for a massive redesign – We spent a great deal of time on giving our apps a fresh look. 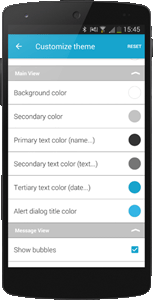 mysms got a new coat of paint and comes with a brand new Material inspired design. A hands on with our updated Android apps. Bold colors, flat elements, clean lines and animations create a fresh user interface. 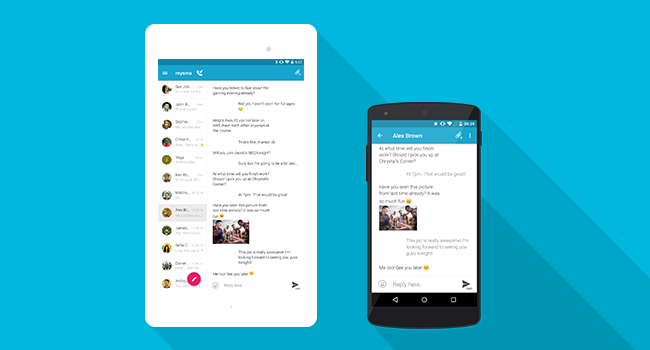 The conversation and message overviews have been updated with a Material Design overhaul. It’s even easier to compose a new message with the replaced “New Message” icon at the bottom of the screen. Moreover, you can directly search for messages and have access to the new settings area. The design of the message view has been wrapped in the latest design standard – the bubbles disappeared and it comes with the fresh Roboto font. Tap on a message to see the message details and open the menu to reveal options like calling the contact or deleting the thread. Add attachments to your messages and choose your preferred sending channel (SMS/MMS/friends) by longpressing the send button. Tap on the avatar or profile pic in the conversation overview to open the beautiful new contact view – the Material Design makes it look fantastic. It includes the picture you saved for this contact (or an avatar) and some other handy options. Also the setting to choose custom notifications (sounds, LED etc.) for each contact has moved to this view. For group chats, a tap on the avatar reveals the view where you can change the group name, add contacts or leave the group. In addition, this view allows you to view contact entries, add contacts to your address book or to send a message to individual contacts. The settings area got a new structure and also found its way to the Material design – it hides in the sidebar now. We tried to cluster the countless options into a clearer structure. We aimed to make it more intuitive, so even loyal mysms users will get used to it very soon. Under Android 5.0 we use Lollipop’s the heads up notification replace the popup. Please make sure that you define the right notifications for mysms in your Android settings (e.g. regarding priority notifications). For those of you who use a lower Android version, the popup is still available and also has become a new design with some great Material Design elements. mysms is not only rocking the standard blue theme, but comes in all themes you already know from the previous version – adapted to the Material Design goodness. When you click on the pencil next to the theme (sidebar – appearance) you can customize the color of nearly every area of the app. 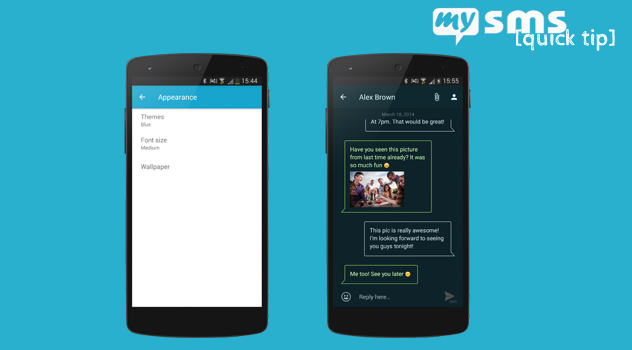 With this redesign mysms comes with the absolutely gorgeous Android Lollipop style. We wanted to take a step ahead Google’s radical new design approach. What do you think of our new look? Google Chrome Extensions are add-ons that allow you to modify and customize your Google Chrome browser. Some extensions add new features to Chrome that make your life easier. So does the brand new mysms Chrome Extension! It helps you to always stay on top of your messages and calls. You will receive notifications, no matter where you are on the web. The new mysms Chrome Extension is one of the simplest ways to send and receive text messages in your Chrome browser. It is directly connected to your Android phone and notifies you on your incoming messages and calls. The installation of the Chrome Extension creates an icon next to the address bar. This icon shows a badge counter as soon as a message or call reaches your phone. How do you get the Extension? 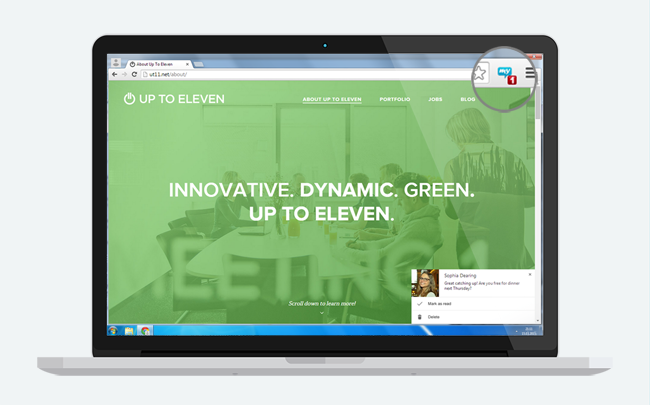 In the Chrome Web Store you will find the mysms Chrome Extension for download. Regular web app users will recognize the interface. Please use your existing mysms account (or the Google Account you used for the registration) for the login. Are you new to mysms? mysms uses your existing Android phone number to send and receive messages and syncs your existing contacts and SMS from your Android phone to your Chrome browser. Therefore, please download mysms on your Android phone first and register for a new account. You can use this account to log in to the mysms Chrome Extension. As texts from Chrome are sent via your Android, your phone needs to be on and must be connected to the internet (mobile data connection or WiFi). Why should you use mysms in your browser? Get access to your messages from your phone and benefit from a larger keyboard while you are working on your computer. You can read and reply to your messages or start a new conversation in your browser, without even touching your phone. But it’s not only an easy and fast way to send and receive SMS/MMS. It’s also great for being up to date on your calls. You’ll receive alerts when a call reaches your phone and you can access your entire call log from your phone. mysms Premium users have access to even more call features. Please keep in mind that the mysms Chrome Extension is currently in beta. If you have any feedback for us, please get in touch at http://support.mysms.com.